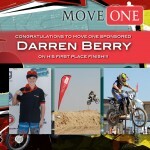 From the age of 2 Darren dreamed of becoming a Motocross athlete and realized his dream at the young age of 5. He started out riding a very old Honda 50cc with only a helmet, goggles, chest protector, and gloves. The rest of his equipment came as he got older as small sizes were very difficult to find.